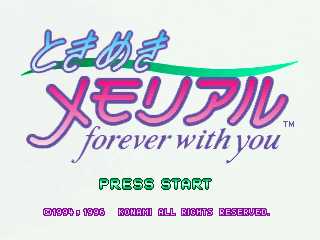 Tokimeki Memorial: Forever With You (ときめきメモリアル ～forever with you～) is a dating simulation game published by Konami for the Sega Saturn. It is a remake of the 1994 PC Engine game Tokimeki Memorial. The game comes with a calendar and trading cards, and the special edition comes with an additional binder. Main article: Tokimeki Memorial: Forever With You/Magazine articles.